Eddie MacDonald was satisfied with his hard earned seventh place finish in the Busch North Series Pepsi 150 at Thompson International Speedway. The Rowley, Mass. driver fought a loose handling racecar in both practices but the HRM Motorsports team was able to get it much better for qualifying. “ We kept adjusting the car all through practice and we finally got it decent and had a great qualifying run”, said Eddie after posting the fifth fastest time. Eddie thought he had a chance at the pole but a little slip cost him. “ I really had it going good and knew the car was fast enough for the pole but I slid up the track coming out of four and it slowed us up.” Eddie and the team were still pleased with the effort as they continue to realize one of their pre season goals to qualify up front each week. Eddie’s fast times have resulted in back-to-back fifth place starting positions. 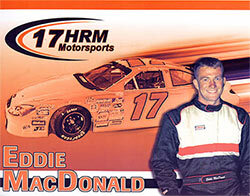 With ten cars on the lead lap on the lap 119 restart, Eddie held the #17 Ford in position for the final laps. After two cautions on laps 134 and 145, he moved up to the eighth right behind Mike Olsen on the lap 150 green white checker restart. After another caution, Eddie battled Olsen over the final laps and was able to make the pass on the final circuit to get the hard earned seventh place finish.